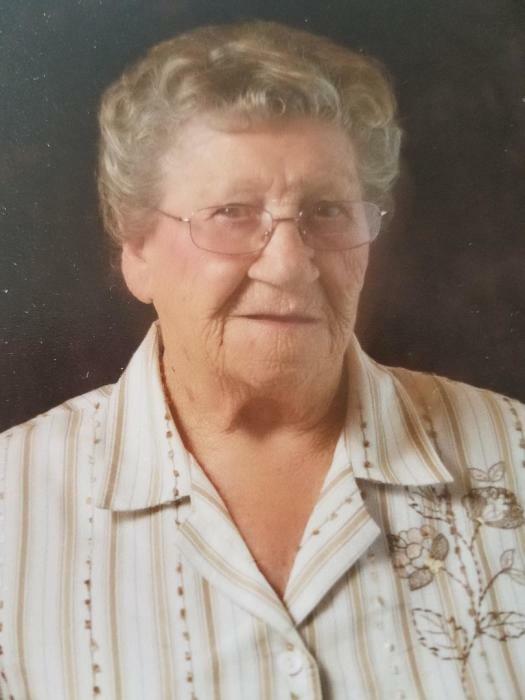 Elsie Mae Riblet, 91, of Streator passed away at 9:05 PM Saturday (April 7, 2018) at O.S.F. St. Francis Medical Center in Peoria. A visitation will be held from 4-7 PM Tuesday at the Hagi & Baker Funeral Home. Funeral services will be held at 11 AM Wednesday at the funeral home. Rev. Scott Fulkerson will officiate. Interment will be in Long Point Cemetery. Honorary pallbearers will be Kevin, John, Zander and Cooper Riblet and Rob, Drew & Brant Dellinger. She was born on January 21, 1927 in Jasper County, IL to Frank & Lillie J. (Williams) Winterrowd. She married Glen M. Riblet on June 28, 1946 in Ottawa, IL. He preceded her in death on August 17, 1983. She is survived by a son, Arthur (Beth) Riblet of Streator; a stepson, Jack Riblet of CA; grandchildren: John (Tara Bronge) Riblet of Streator, Kevin (Jesse) Riblet of Streator and Cyndi (Rob) Dellinger of Streator; great grandchildren: Drew, Brant & Ema Dellinger and Cooper, Zander, Brynlee and Kendel Riblet; sisters: Lois Britton, Doris Dorn, Wanda (David) Levington and Dansel Boldrey all of Dieterich and Reta Green of Whitwell, TN; brothers: Larry (Mary) Winterrowd of Wheeler and Gary (Cindy) Winterrowd of Kirkland. She was preceded in death by her parents, husband; a great granddaughter, Colbie Riblet; brothers: Walter, Charles, Frank & Lovell Winterrowd and sisters: Margie & Phyllis Winterrowd. She resided in Streator since 1946 and retired from the Physical Therapy Department at St. Mary Hospital in 1989. She was a former member of the Streator Moose Family Center and she loved to fish. Memorials may be directed the American Diabetes Foundation or the C.D.L.S. Foundation.